The British Pound rose for a fourth consecutive day against the Japanese Yen, with prices now eyeing resistance above the 178.00 figure. Near-term resistance is at 178.74, the 38.2% Fibonacci retracement, with a break above that on a daily closing basis exposing the 50% level at 179.94. Alternatively, a turn below the 23.6% Fib at 177.26 clears the way for a challenge of the 175.77-176.35 area (triple bottom, 14.6% retracement). We see the overall GBPJPY trend as favoring the downside after last week’s break of the 12-month uptrend set from February 2014 lows. With that in mind, we will opt against entering long and treat on-coming gains as corrective, looking for the move to offer a selling opportunity once upside momentum is exhausted. Inflation data in New Zealand and Australia, Poloz and Stevens’ speeches, German ZEW Economic Sentiment and German Ifo Business Climate, US Unemployment Claims and Durable Goods Orders are the highlights of this week. Here is an outlook on the top events on Forex calendar. 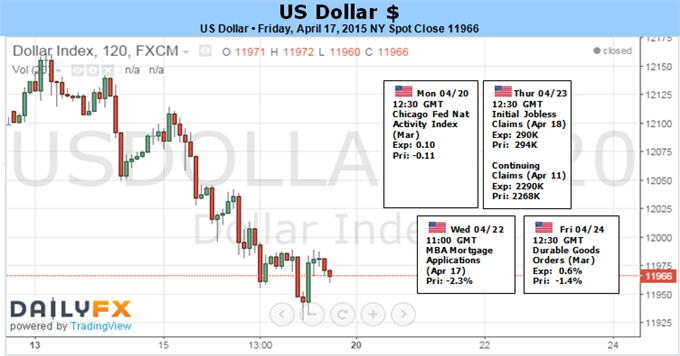 Last week, US data disappointed with weaker than expected housing and employment data as well as soft retail sales. Jobless claims rose 12,000 to 294K, building permits came reached 1.04 million while forecasted 1.08 million and housing starts hardly recovered with 0.93 million. Retail sales registered a 0.9% increase, below the 1.1% rise predicted and Core sales gained 0.4% far below the0.7% expected. However, the Philadelphia Fed Manufacturing Index surprised with 7.5 points vs. 5 in the previous months exceeding forecasts for a 6.5 points reading. 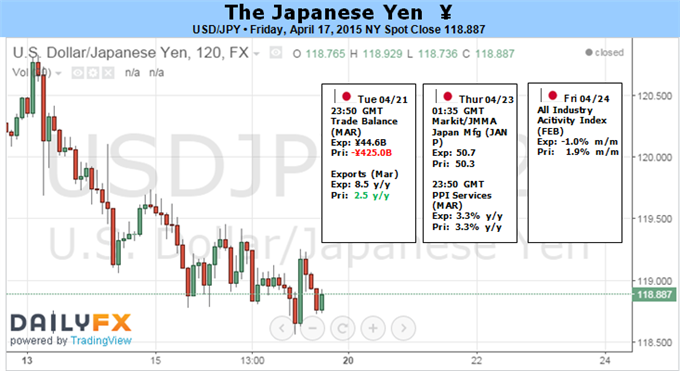 Will the US data stabilize this week? New Zealand Inflation data: Sunday, 23:45. Consumer prices in New Zealand declined by 0.2% in the fourth quarter of 2014, amid lower oil and vegetables prices. This was the first decline since the fourth quarter of 2012. Analysts expected rates to remain unchanged and expected an annual growth of 0.9% rather than the 0.8% reported. However, international air fares edged up 7.3%, while domestic air fares expanded 8.3%. Housing costs were also a positive contributor to inflation in the December quarter. Consumer prices are expected to decline once more by 0.2%. Stephen Poloz speaks: Monday, 15:05. BOC Governor Stephen Poloz is scheduled to speak in New York. Poloz may talk about the central bank’s decision to keep its key overnight lending rate unchanged and about his bright forecast for Canadian growth despite the current slowdown forced by the oil price collapse. Glenn Stevens speaks: Monday, 17:30. RBA Governor Glenn Stevens is expected to speak in New York. He may refer to The RBA’s decision to leave the cash rate unchanged at 2.25%, despite talks of a rate cut. Eurozone German ZEW Economic Sentiment: Tuesday, 10:00. German investors’ sentiment remained positive in March, climbing for the fifth time to 54.8 from 53 in February amid rising domestic demand. However concerns about Greece and Ukraine clouded future outlook. Analysts expected a higher figure but predict optimism will grow in the coming months after the fog, surrounding Greece and Ukraine, clears. Investors sentiment is expected to rise to 56. Australian inflation data: Wednesday, 2:30. Australian inflation in the last quarter of 2014, rose 0.2% following 0.5% rise reported in Q3. The reading was below expectations reflecting lower prices for transport, due to the ongoing decline in oil prices, as well as for healthcare. Falling fuel prices are the main cause for the tame inflation in the fourth quarter. But Core inflation a more precise measure posted a 0.7% gain reaching an annual 2.3% just above the bottom of the RBA’s 2-3% target range. CPI is forecasted to gain 0.1%. US Unemployment Claims: Thursday, 13:30. The number of Americans filing initial claims for unemployment aid increased by 12,000 to 294,000, rising for the second straight week. However, the number of jobless workers is still low. The four-week average, edged up by 250 to 282,750, nearly the same as in the prior week. The total number of Americans seeking aid declined to 2.27 million, the lowest in more than 14 years. The number of claims is expected to reach 90,000 this week. Eurogroup Meetings: Friday. The Eurogroup meetings attended by Finance Ministers from the euro area will be crucial for Greece. Unless a funding agreement is reached, Greece will not get the third aid program from the ECB, resulting in a default. Athens has not received bailout aid since August last year and has been hard pressed to cover payments amid a cash crunch, resorting to measures such as borrowing from state entities to tide it over. Eurozone German Ifo Business Climate: Friday, 9:00. German Ifo business climate edged up to 107.9 in March from 106.8 in February, beating forecast for 107.3. Optimism about current conditions rose as well as six months outlook. Strong growth and low oil prices boosted domestic demand. Ifo economists believe expansion will continue in the coming months. US Core Durable Goods Orders: Friday, 13:30. Orders for long lasting goods declined in February by 1.4% contrary to forecast of 0.3% gain. Meanwhile, core orders fell 0.4% posting the fifth straight monthly decline. The weak figures suggest softening in domestic demand despite growth in employment. However, economists expect growth will increase in the coming months. Dollar Stumbles but Will it Fall as Markets Debate Fed Hikes? The Dow Jones FXCM Dollar Index (ticker = USDollar) dropped 1.1 percent this past week while the ICE Dollar Index tumbled 1.8 percent. That represents the second worst week for the even-weighted measure (USDollar) in 12 months and the second worst performance for the EURUSD-heavy gauge in 22 months. Have speculators over-reached on this advantaged currency? The recent stumble after two months of consolidation alongside speculative positioning suggests that may be the case. However, as market participants weigh the impetus for correction against the tangible fundamental appeal the currency holds over the longer-term; progress will lean heavily on meaningful catalysts to motivate a counter-trend move. And, this week’s docket will struggle for the high profile drivers while the period after is overstocked with redefining updates. From a fundamental perspective, it is important to establish the longer-term position for the Greenback. Treasury Secretary Jack Lew at the G-20 noted the United States’ economic dominance when he remarked that it was not ‘sufficient’ that the US be the lone driver of global growth. That bodes well for investor returns (and thereby capital inflow) alongside the first-mover advantage the Fed seems to be taking with its relatively hawkish monetary policy standing. Furthermore, in the event of a global financial slump; the Dollar will likely revert back to its ‘haven’ status – after a certain intensity is reached. Medium to long-term, the currency looks well positioned to advance further. Yet, that doesn’t preclude it to interim corrections. A ‘correction’ is what lurks for the Greenback. Nine-months of steady climb in the most rapid move since the early 1980’s mixes both fundamental reasoning and speculative exuberance. It is the faction that participated to take advantage of momemtum rather than hold positions to realize long-term developments that pose the currency short-term risk. It is difficult to establish exactly how much excess could be worked off, but positioning measures can act as a proxy. The CFTC’s Commitment of Traders (COT) report this past week showed a continued reversal from the record net-long exposure set in January. Now at its lowest level since the end of December, there is still plenty of room for moderation as we’ve only seen a 13 percent retreat from the bullish shift that began in 2012. The most capable driver for the Dollar in its long and short-term course is monetary policy. This past Friday, a range of inflation measures bolstered the persistent doubt of near-term FOMC rate hikes. The headline CPI reading for March slipped back into negative territory (-0.1 percent), a real average weekly earnings figure retreated from its series high to a 2.2 percent clip and price forecasts from the University of Michigan confidence survey posted sharp declines. Caveats of robust core measures and the general trend of the wage numbers factor in, but viability of a near-term hike is certainly diminished. According to Fed Fund futures, the first hike is once again not fully priced in until January 2016. Moderated rate expectations reinforced by tepid data, but it’s capability as a fundamental driver is diminished considering the time frame yields imply and the persistent buoyancy of the Dollar – a rate hike may come later but it is still a hike among QE programs. Sentiment may simply tip out of favor for the Greenback and pull it lower, but the most effective means would by through key event risk to focus the selling effort. For the coming week’s docket, there is limited high-profile event risk to hit all traders’ radars. And, marking a meaningful distraction, there are very high profile events in the following week (FOMC decision and GDP amongst others). As we keep an eye on the evoluation of rate speculation, it will also be important to monitor risk trends. While extreme risk aversion would eventually buoy the USD, the aspect of its meteroric rise based in growth and interest rate expectaitons can be tripped up in initial phases of a speculative retreat. Last edited by 1Finance; 04-18-2015 at 04:21 AM. 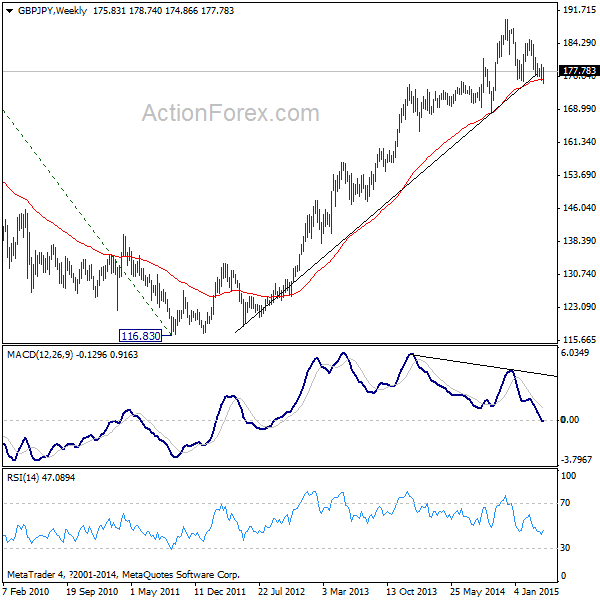 The Weekly Volume Report: Dollar Trying To Turn? 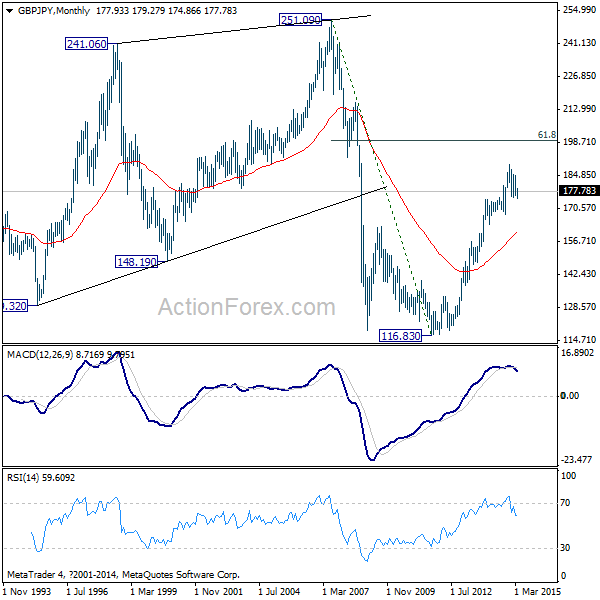 The fundamental event risks lined up for the final full-week of April may heighten the appeal of the Yen and spark a further decline in USD/JPY as the Japanese economy gets on a firmer footing. With Japan expected to post a trade surplus for the first time since June 2012, prospects for a stronger recovery in 2015 may encourage the Bank of Japan (BoJ) to retain a wait-and-see approach at the April 30 interest rate decision as Governor Haruhiko Kuroda remains confident in achieving the 2% inflation target over the policy horizon. In turn, Japanese officials may continue scale back their verbal intervention on the local currency, and the bearish sentiment surrounding the Yen may continue to diminish over the near to medium-term as the central bank turns increasingly upbeat on the economy. In contrast, the recent weakness in the U.S. may further dent expectations for a Fed rate hike in June, and another series of weaker-than-expected data prints may spark a larger correction in the greenback as interest rate expectations get pushed back. Despite expectations for a 0.6% rebound in U.S. Durable Goods, it seems as though lower energy prices are failing to drive private-sector consumption amid the ongoing weakness in retail spending, and another unexpected decline in demand for large-ticket items may trigger a larger correction in the greenback as it drags on the outlook for growth and inflation. In turn, we may see a growing number of Fed officials show a greater willingness to retain the zero-interest rate policy beyond mid-2015 at the April 29 meeting. With that said, the improving terms of trade for Japan paired with the ongoing slack in the U.S. economy may prompt a further decline in USD/JPY, and the pair may continue to give back the rebound from March (118.32) amid the shift in the policy outlook. Impressive UK employment data helped push the British Pound sharply higher versus the US Dollar and other major counterparts, and the recent reversal in fortunes leaves us in favor of continued GBP gains through the foreseeable future. The FX market is a question of relative performance, and the fact that US economic data and interest rate expectations have been notably better than their UK equivalents helps explain why the British Pound/US Dollar exchange rate recently fell to five-year lows. Yet things have turned for the US currency as a recent tumble in domestic yields have left it at a lesser advantage versus the British Pound and others. The difference between UK and US 2-year government bond yields now stands near its smallest since November, 2014, and the GBP/USD exchange rate has moved higher in kind. Traders will look to upcoming Bank of England Monetary Policy Committee minutes to drive moves in UK interest rates, while a relatively empty US economic calendar suggests broader market volatility may slow through the coming week. The key question is whether recent improvements in UK economic data will be enough to force the Bank of England into action sooner than currently expected. Headline UK Consumer Price Index inflation printed at exactly 0.0 percent through March—well-below the BoE target of 2.0 percent. This fact in itself suggests the central bank will be in no rush to raise rates through the foreseeable future. And yet recent employment numbers show domestic unemployment has fallen to seven-year lows, while broader consumption and economic activity data points to strong growth through 2015. 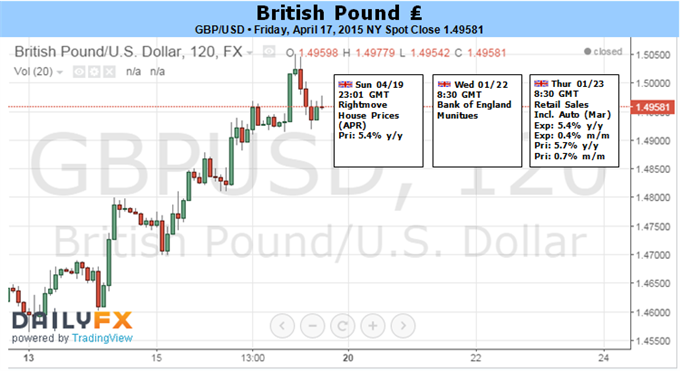 All else remaining equal, the improvement in the data should have been enough to send the British Pound even higher. The critical point remains that political uncertainty surrounding UK elections on May 7 have hurt the British Pound against major counterparts. Derivatives markets show that GBP/USD volatility prices/expectations trade near multi-year highs given clear indecision in UK electoral poll figures. Ultimately, however, fears over post-election political disarray may be overdone. And indeed further improvements in economic data and interest rate expectations could fuel a larger British Pound recovery versus the US Dollar and other major FX counterparts. 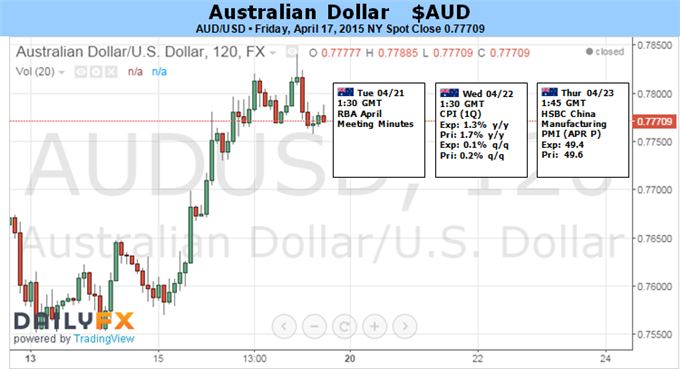 The Australian Dollar is on pace to produce the first series of back-to-back weekly gains in three months. The currency shrugged off losses sustained early in the week on the back of disappointing Chinese trade figures following an impressively strong March jobs report. The decidedly upbeat outcome weighed against RBA interest rate cut speculation. Traders now price in a 58 percent probability of a 25bps cut at next month’s central bank policy meeting, down from 78 percent at the start of the week. Looking ahead, first-quarter CPI figures will continue to inform investors’ RBA outlook. The benchmark year-on-year inflation rate is expected to decline to 1.3 percent, the lowest in almost three years. As with many of its G10 counterparts however, the RBA has been reluctant to fight short-term price growth weakness. Policymakers have argued that downside pressure will dissipate with rebasing as the impact of last year’s sharp drop in energy costs is unwound, leaving medium-term trends targeted by central banks intact. With that in mind, traders will probably focus on the “trimmed mean” CPI measure, a metric that aims to strip out up- and down-side price growth volatility extremes to get at the core inflation trend. This is expected to hold at 2.2 percent, unchanged from the fourth quarter. That would mark a break from disinflation seen in the second half of 2014, which may further reinforce perceptions that the RBA is in no hurry to top up stimulus and boost the Australian unit. Chinese news-flow represents another significant inflection point. The Aussie overlooked dismal industrial production figures from the East Asian giant last week, with the release seemingly overshadowed by a concurrently published first-quarter GDP report that printed in line with forecasts. The week ahead will bring a timelier measure of the business cycle in Australia’s top export market via the flash estimate of April’s HSBC Manufacturing PMI measure. Accelerated contraction in factory-sector activity is expected, which may cap the Aussie’s upside potential. Gold prices are softer for a second consecutive week with the precious metal off nearly 0.27% to trade at $1204 ahead of the New York close on Friday. Price action has been uninspiring over the past few sessions despite broader volatility in equity markets, with S&P posting its largest single-day decline since March 25th. The March US Consumer Price Index (CPI) released on Friday was mixed with the headline year-on-year print showing a contraction of 0.1% while the core rate increased from 1.7& to 1.8% y/y. 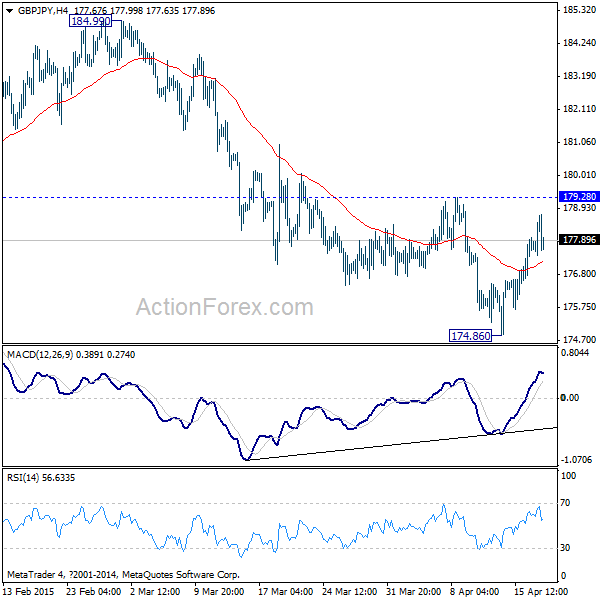 The data offered little assistance to the battered greenback with the dollar trading heavier against all of its major counterparts heading into the close of the week. Gold looks to close the week within the initial weekly opening range with prices continuing to contract after failing to breach above the March highs earlier in the month. Economic data will be light next week with US Durable Goods Orders on Friday highlighting the docket. Aside from the ongoing political uncertainty in Europe, traders will be closely eyeing the greenback with the Dow Jones FXCM U.S. Dollar Index (Tickers:USDOLLAR) now at risk for a correction lower after breaking below multi-month slope support. The broader picture for gold remains bearish as expectations for a Fed interest rate hike this year continue to weigh on demand for non-yielding assets. However, the Fed now runs the risk of further delaying its first interest rate hike in nearly a decade as growing geopolitical concerns, strength in the dollar and soft inflation continue to limit the central bank’s scope to begin the normalization cycle. As such gold may continue to see a reprieve with the momentum profile suggesting more upside may be on the cards before the resumption of the broader down trend. From a technical standpoint, the near-term outlook remains clouded as the monthly range continues to compress. Key support rests at 1173/77 and we will reserve this threshold as our medium-term bullish invalidation level. Interim resistance is eyed at 1214 (April high day close) backed by the 50% retracement of the 2014 range / 200-day moving average at 1225/29. 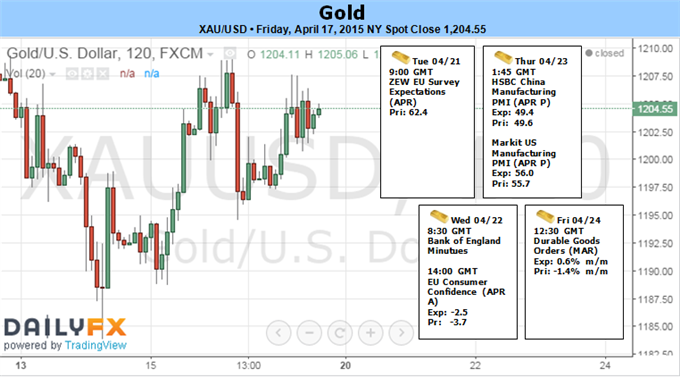 Key resistance stands at 1245/48 with a breach above targeting objectives into 1300. That said, we’ll be looking for a break of the monthly opening range to validate our near-term bias with the broader outlook weighted to the topside while above 1173. 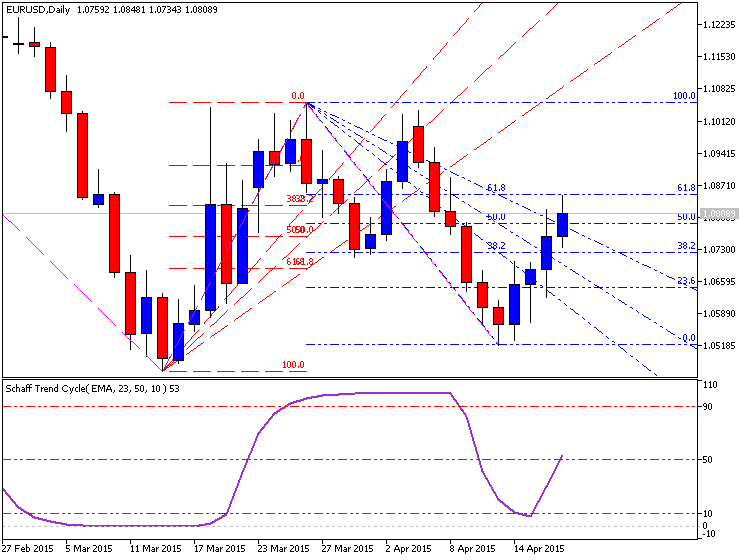 The EUR/USD soared to a near term high at 1.0808 after the release of inflation data and strong comments from Mario Draghi on Thursday. USD outlook has become more balanced which is likely to drive near‐term USD weakness but over the medium term the USD should still be supported. The DXY USD index is flirting with a break below its 50‐day MA, a level it hasn’t traded through since July, accordingly technically the USD index is shifting and a close below here today would be important. The fundamental side has likely caught up to the data surprises, which have continued to be disappointing for the US. 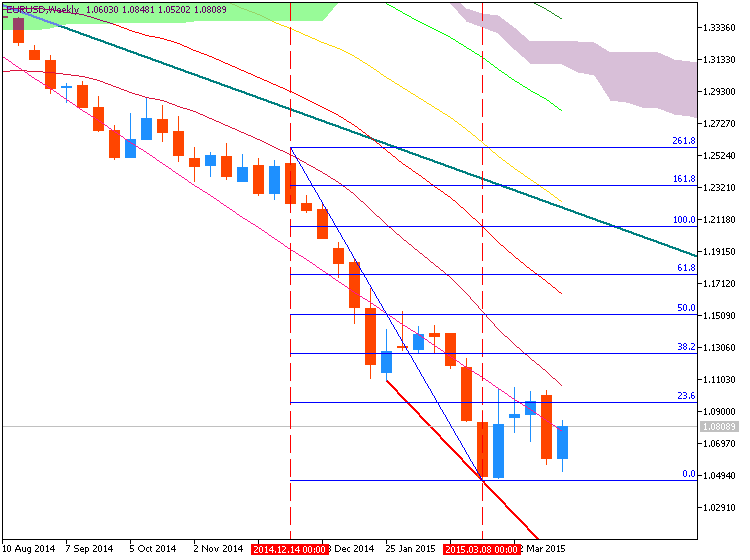 The euro is stronger, having rallied back above 1.08 and moving towards its 50‐day MA. Fundamental data was essentially as expected with inflation in line with the flash estimate. Greece continues to be a core focus, with April 24th’s Euro‐Area meetings particularly important. German and French yields continue to fall, driving an increased focus on the risks around bond scarcity for the ECB QE program. Data released this week showed the Eurozone is fighting its way out of deflation, as prices rose for the second month straight, easing fears it could enter into a prolonged period of price falls. The single currency area’s annual inflation rate rose to -0.1 per cent in March, up from -0.3 per cent a month earlier, according to its official statistics agency. This was in line with analysts’ expectations. 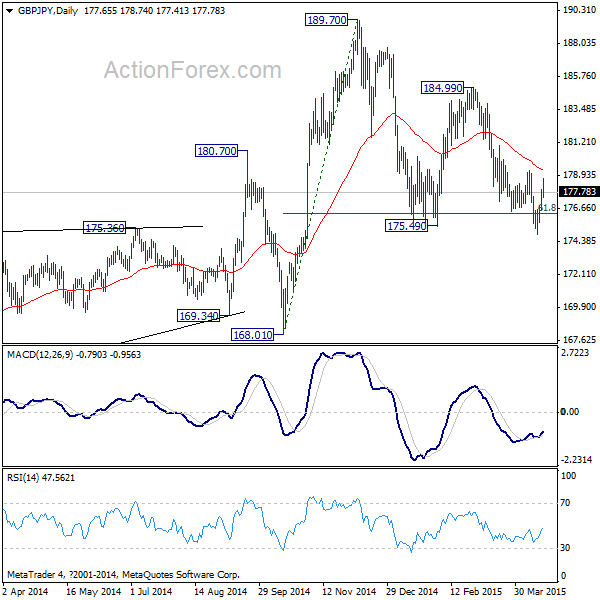 GBP/JPY dropped to as low as 174.85 last week but couldn't sustain below 175.49 support and recovered. Initial bias is turned neutral first. Near term outlook will stay bearish as long as 179.28 resistance holds. Below 174.86 will extend the fall fro 189.70 and target 168.10 key support level. However,decisive break of 179.28 will indicate near term reversal and will turn bias to back to the upside for 184.99 resistance instead. In the bigger picture, the up trend from 116.83 lost much medium term momentum with bearish divergence condition seen in weekly MACD. Medium term top could be around the corner, if not formed. Break of 168.01 support will confirm this bearish case and bring deeper correction. Though, as long as 168.01 holds, the up trend could still extend to 61.8% retracement of 251.09 to 116.83 at 199.80, which is close to 200 psychological level. In the longer term picture, the up trend from 116.83 long term bottom is still in progress. Current rise could likely at lease have a test on 61.8% retracement of 251.09 to 116.83 at 199.80 in medium term. Break of 168.01 will bring deeper correction first. Great Thanks 1Finance for in-detailed review.